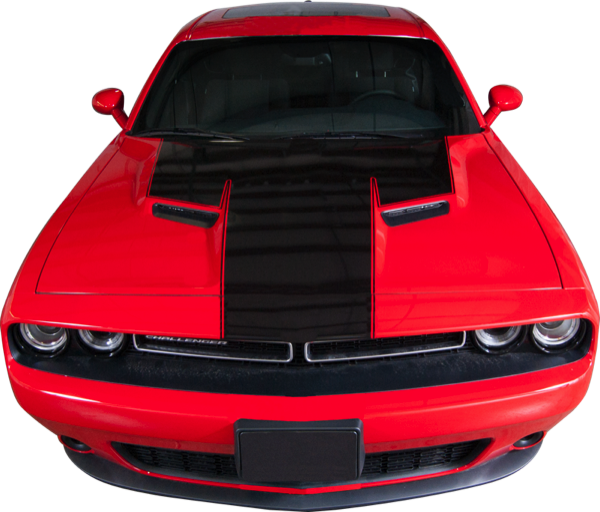 2015-18 Dodge Challenger Hood & Front Panel Stripe with Accent Line - Stencils And Stripes Unlimited Inc.
2015-18 Dodge Challenger Hood & Front Panel Stripe with Accent Line. Our hood stripe sits on top of the raised hood area and features an accent stripe surrounding the hood decal . The stripe extends onto the front header panel unit. This kit is manufactured on 2 Mil High Performance vinyl and is available in Matte Black, Gloss Black, White, Red, and Silver Metallic. The stripe kit includes an application squeegee and 3M vinyl information application sheet. We use High Performance vinyl since lower grade products are prone to shrinkage and releasing.